Kitty cats you know how much I adore my magazines. While I spend my days browsing blogs on the Internet, the moment night falls there is nothing I adore more than curling up with a colorful glossy, and flipping through the pages until slumber completely overtakes me. 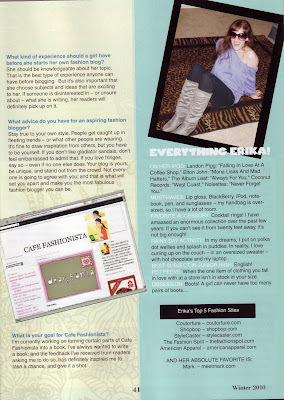 Hence the reason why I was so thrilled when Angie Rangel and Carol S. Rothchild, the Publisher and Editorial Director of SIX7*8th Magazine asked me to be a part of their Cool Careers series under the title Fashion Blogger for the Winter 2010 issue. Despite the fact that I am long out of junior high (SIX7*8th’s target audience), I have been a huge fan of the magazine since its debut back in 2006, and even had the opportunity to be a contributor, and interview The Jonas Brothers for them a few years back; therefore I jumped at the chance to be a part of such a fun project! After what seems like years – but, in all actuality, was only a couple of months – the issue has finally hit stands! I am scanning the interview on here (click the images to enlarge them! ); but do go out and buy a copy if you’re able, as the magazine is full of fabulousness that is sure to make you a forever fan – regardless of age! Thanks to SIX7*8th for the magazine scans, and Tiffany Sorocco (my sister) for the picture of me in the sunnies. Don't forget to enter The Little White Dress Giveaway for your chance to win the Aryn K Ivory Ruffle Dress from TheWhiteDressShop.com. CONGRATS DOLL! You are fabulous! wow thats so exciting! congrats! Congrats! I've never heard of this magazine before. It looks like a fun one! OMG, Erika! This was the most fabulous thing ever! I'm so proud of/happy for you!! You go, girl! This is beyond awesome, Erika! I so enjoyed reading your Q&A answers. I think you stand out among the blogger pack because not only do have an impeccable blog etiquette, you're so thoughtful and genuine in your responses! I especially enjoy reading your comments on my blog. You're definitely a "friend in my head" ;o) And if we didn't live cross country, you'd surely be a Real Life friend too! I'm so glad you're living out your dream. And I'm so happy for the opportunity to get to know you a bit. You're definitely a beautiful person - inside and out - and you deserve nothing but great things! Congrats, my friend!! BTW, young Erika is just too cute for words! PS- I am a magazine freak too, I will check for this one at the store this weekend! This is so cool! I think you are an amazing writer and love that you're published! Very happy for you! That is amazing! You are amazing and I am loving every bit of it. You should be my next interview! Seriously, you are so talented and amazing. Congratulations Erika! Love, love, love the picture of fashionable little E. and all your tips are very relevant (4 hours/day? I agree). I don't know if they sell the magazine in the UK but I'll look out for it. Congrats Erika... this is just too awesome. If only this magazine is available here in the Phil, I will definitely buy it. SO exciting -- and completely deserved. I love, love, love your blog. Bravo! Congrats honey, that is AMAZING!!!!!! You're so fabulous. OMG how freakin awesome is this, E? You are the BEST! And this feature is just gorgeous, like you and your blog! That is soo exciting. Congrats, it sounds like a cute magazine and wonderful opportunity. Best of luck! Don't forget about my giveaway!!! I love my Guns n Roses and Muse but I've always loved the JB :D It's kind of odd, actually. You're awesome and now they've acknowledged it too. Congrats famous lady! Just remember those who know and loved you in the beginning! congratulations sweetie!I'm so happy for you! GOOD FOR YOU :) wow I'm happy for you, you're such a rockstar. Oh my gosh!!! That is so cool. Congratulations!! It's so good to see a fellow blogger in the pages of a magazine. It's definitely very cool. This is a great surprise. How sweet. Love the cover and the article abotu you too. Great stuff! that is awesome, Erika. You deserve such an exciting honor. ERIKA!! You are a rockstar and my IDOL!! I've been trying to pitch to the mag for a couple years now (I've written for Discovery Girls before! ), but have had no luck...any secrets? Erika! Oh my gosh, you look adorbs in the article. =) Congrats, babe!! p.s. I wish I had more time to read my magazines . . . WHAAAA?! Well, as if I would expect anything different from this amazing blog! How wonderful, how delightful! I am SO SO SO happy for you! Congratulations on the feature! So great! That's so wonderful--congrats!!! That mag looks so cute even if it's for teenagers. Congratulations! You are a lovely blogger and definitely deserve it! Oh Lovely Girl how fabulous you are! You deserve this! Yay for you, how exciting!!! Erika, that is a great interview! I'm many years out of middle school, and I adored it. How exciting! I can't wait to hear more on that book you have in the hopper... I would read it, absolutely! Hi there-wow congratulations thats really great for you!! I hope more offers come rolling in. That magazine needs a re design tho :/ they're using no no fonts!!! They should hire me! haha. how exciting, i wish i'd have a copy! CONGRATS!!! You deserve the attention! eeep how exciting! i adore your blog, congrats!!! Yaay Erika!! Congratulations darling its so well deserved - how exciting! Merci beaucoup for your lovely comment on my blog and for actually reading the post! WOW!!! Erika! That is so super exciting!!! CONGRATULATIONS!!!! Happy Friday!! Have a great weekend!! Erika - that is so cool! Great article on you. You deserve it - you are always writing amazing pieces for your blog and are so creative with all your thoughts and ideas. So Awesome!! God, can somebody be more lucky? Girl, you're georgeous! u're such a nice and great bloggers.. i deserve to get that..
and i love u just like the others..
That is so exciting! Congratulations. You deserve it!! Erika!! This is sooo sweet, dear!! There's nothing like getting featured in a printed media actually! Congrats and you totally deserve it!! :) I'm catching up on your blog posts after quite a while since I've been busy enjoying the spring break (as you will see on my facebook and blog! )but hey, I am reading every word! :) Much love!